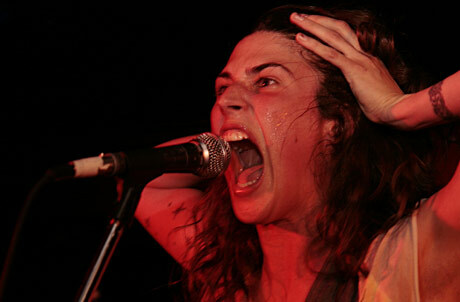 Montreal’s Hot Springs proved to be the epitome of awesomeness in their Friday night performance at the Comfort Zone. Easily delivering the festival’s most impact and giving me a new favourite rock act, the band’s consummate showmanship and ferocious energy was unparalleled. With a voice somewhere between Björk and Feist and guitar skills akin to QOTSA’s Josh Homme, lead Hot Spring, Giselle, is so talented that her musical charms distract you from the fact that she’s also the sexiest woman in music today. The rest of the band are similarly impressive, with particular kudos to the phenomenally solid and creative drummer.